The 50th league meeting between these great rivals was indeed a golden occasion as they served up a brilliant clash full of intensity at Austin Stack Park, Tralee on Saturday night. An attendance of 11,982 spectators got great value as Dublin came with a storming finish to come from five points in arrears to draw level, had chances to win, but fell foul to a well-worked late Kerry score. Kerry looked in control when they moved 1-15 to 2-7 clear when sub Tommy Walsh scored with just less than a half hour remaining. But heading into the last ten minutes Dublin summoned up all their battling spirit following the sending off of Michael Fitzsimons (second yellow card) to hit four unanswered points from Brian Fenton, Paul Mannion (free) and two (one free) from Cormac Costello to draw level three minutes into added time. However, it was the Kingdom who had the final word when Stephen O’Brien and David Moran combined to release Peter Crowley to fist over the winner in the 74th minute. The opening half was played at championship pace and when the dust settled Kerry were 1-11 to 2-6 to the good. The Kingdom started the better but Dublin had just established a firm footing though trailing 0-6 to 0-5 when disaster struck in the 23rd minute. A high delivery by Dara Moynihan into the danger area created confusion in the last line of the Dublin defence and Stephen O’Brien latched onto a breaking ball to beat Evan Comerford from close range. Dublin responded in magnificent fashion when Con O’Callaghan cut a direct path for the Kerry goal and his shot took a deflection on its way past netminder Shane Ryan. 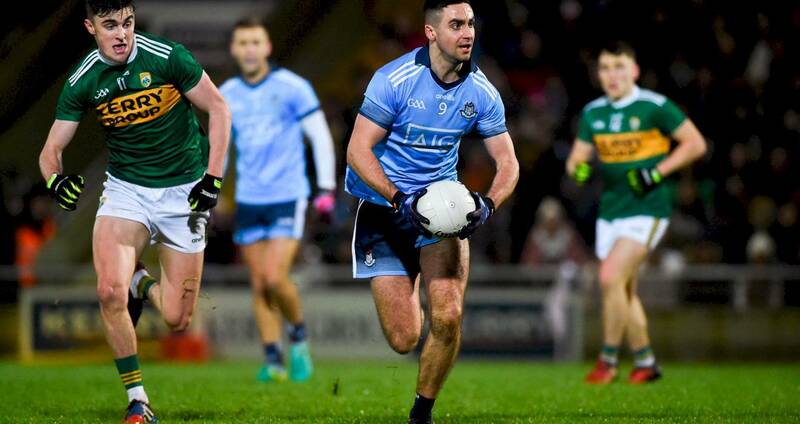 Back came Kerry with four points in succession - Tom O’Sullivan, two Seán O’Shea frees and Dara Moynihan – but before the interval Paul Mannion got a classic Mannion goal when he rounded his man and arrowed for goal firing low to the net for Dublin to trail by two points at the break. SCORERS - Kerry: S O’Shea 0-8 (0-6f, 0-1 ‘45’), S O’Brien 1-1, P Geaney, D Moynihan 0-2 each, J Sherwood, T O’Sullivan, G O’Brien, T Walsh, P Crowley 0-1 each. Dublin: D Rock 0-5 (0-4f), P Mannion 1-2 (0-1m, 0-1f), J McCarthy 0-3, C O’Callaghan 1-0, C Costello 0-2 (0-1f), D Gavin, B Fenton 0-1 each. KERRY: S Ryan; P Crowley, J Sherwood, B Ó Beaglaíoch; T Morley, P Murphy, T O’Sullivan; J Barry, A Spillane; D Moynihan, S O’Shea, G O’Brien; D O’Connor, S O’Brien, P Geaney. Subs: T Walsh for O’Connor (ht), M Griffin for Spillane (53), G Crowley for Geaney (55), D Moran for Morley (60), M Geaney for G O’Brien (70). DUBLIN: E Comerford; M Fitzsimons, E Murchan, E Lowndes; J McCarthy, J Cooper, J Small; B Fenton, D Gavin; N Scully, C O’Callaghan, B Howard; P Mannion, D Rock, C Costello. Subs: P Andrews for Lowndes (ht), J McCaffrey for Cooper (47), K McManamon for Rock (61), P Flynn for Scully (61), MD Macauley for Gavin (61).